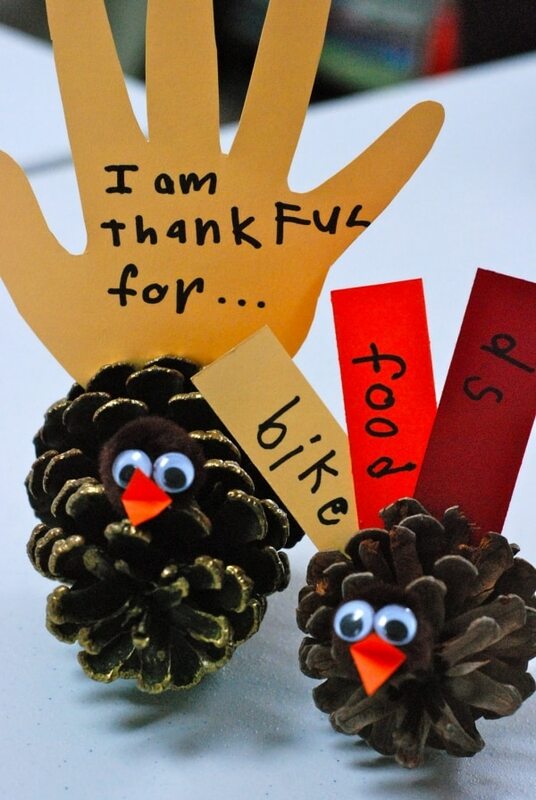 To help teach kids about the main reason for the Thanksgiving holiday and to help us all to remember to be more thankful, here are 15 creative thankful crafts for kids — and the whole family! 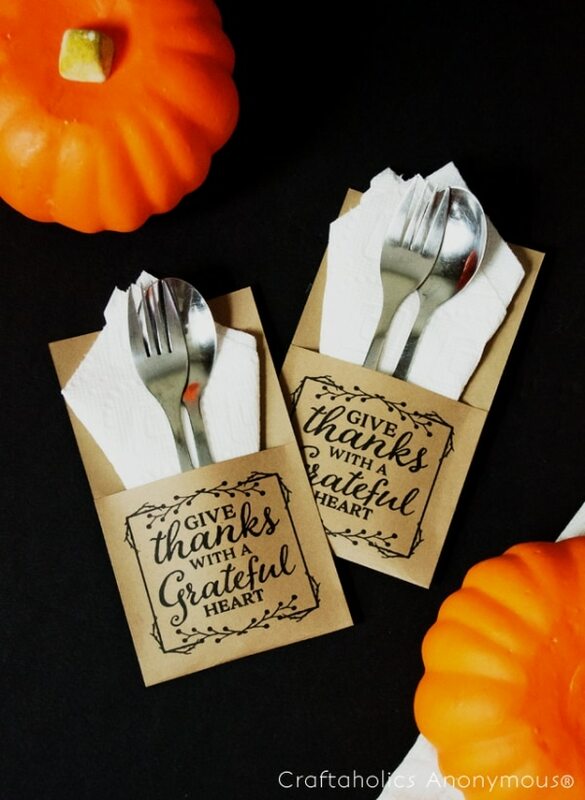 If you need more great Thanksgiving projects, check out these fun DIY décor ideas as well as these creative napkin ring projects! Try to wait to put up your Christmas tree until after Thanksgiving. 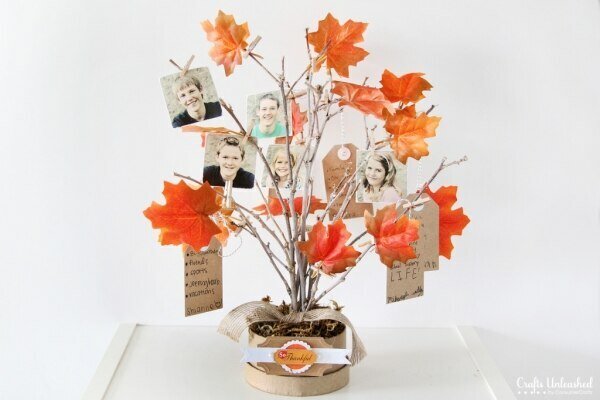 Instead, use leafless branches, pretty leaves, photos, and tags to decorate a Thankful Tree. 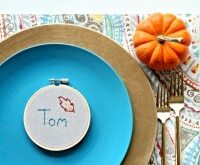 Encourage family members to write the people and things they are most thankful for on the tags. Kids will enjoy creating these adorable pinecone turkey friends by adding eyes and beaks. 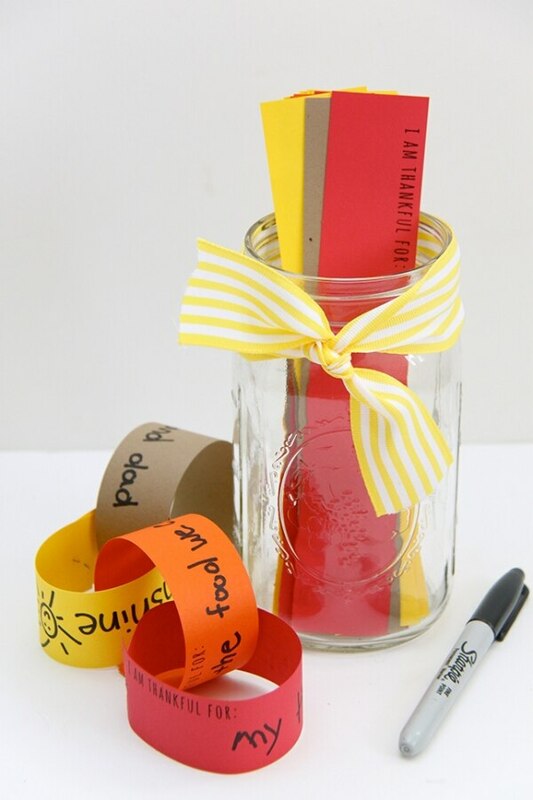 Use paper handprints or strips of paper to create feathers, each with a thankful sentiment. Encourage kids to make their birds as feathery as possible! 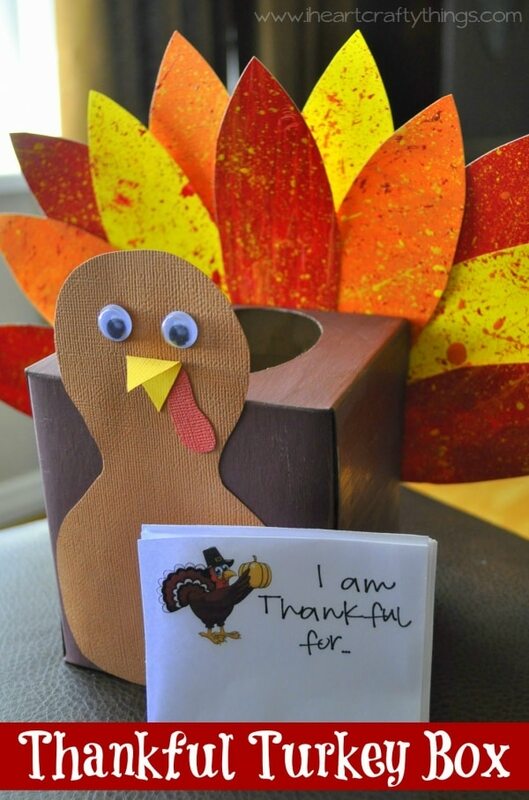 Re-purpose an old tissue box into this adorable turkey. 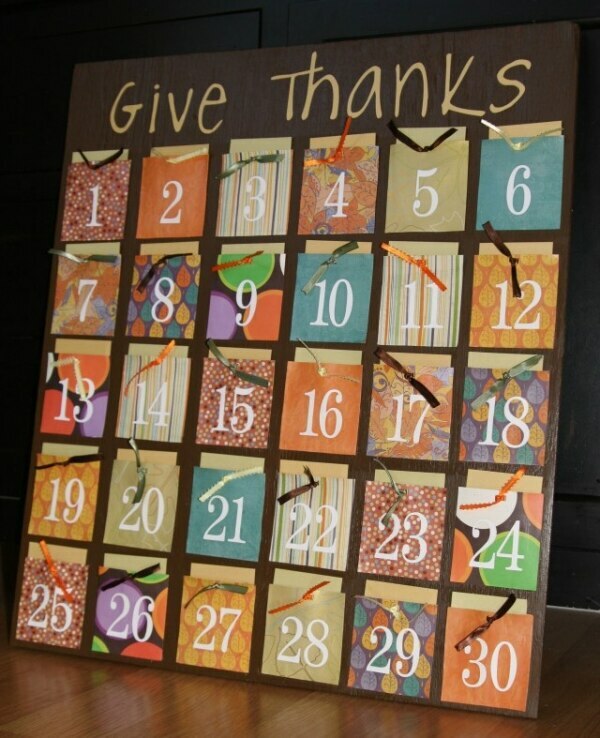 Add a turkey body and pretty paper feathers, then encourage the family to fill up the box with thankful notes and messages. 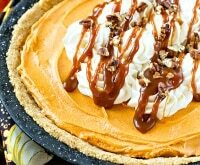 Read through them daily all month long or savor the sentiments over Thanksgiving dessert! 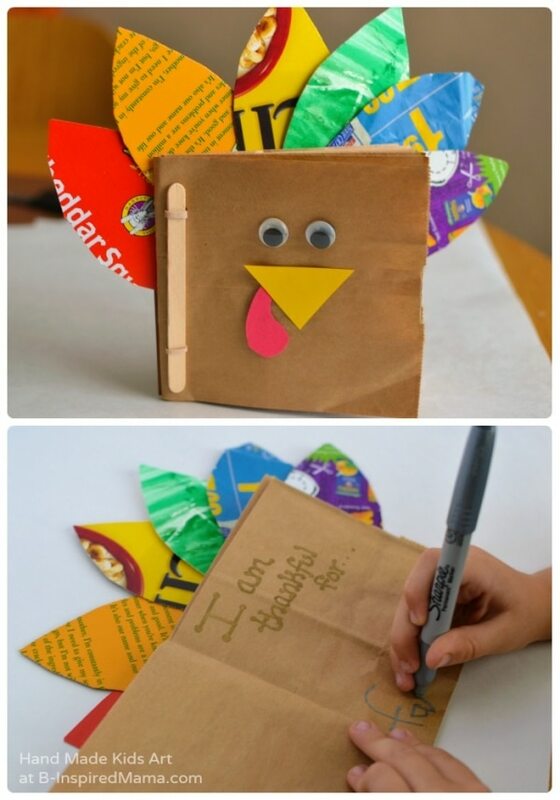 Brown paper bags and colorful cardboard food boxes are put to clever use in this charming thankful turkey book. 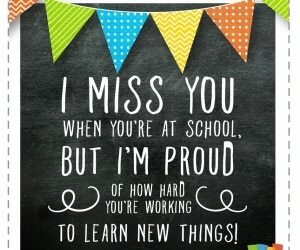 Help the kids assemble the book, then ask them to add to the book on their own all month long. 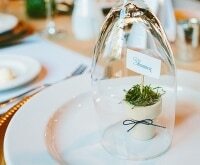 Create mini envelopes out of paper, then adhere number stickers to each one to represent the days of the month. 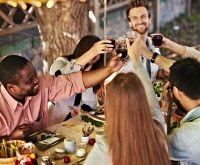 Load the envelopes with thankful sentiments or reflective activities you can do each day as a family. 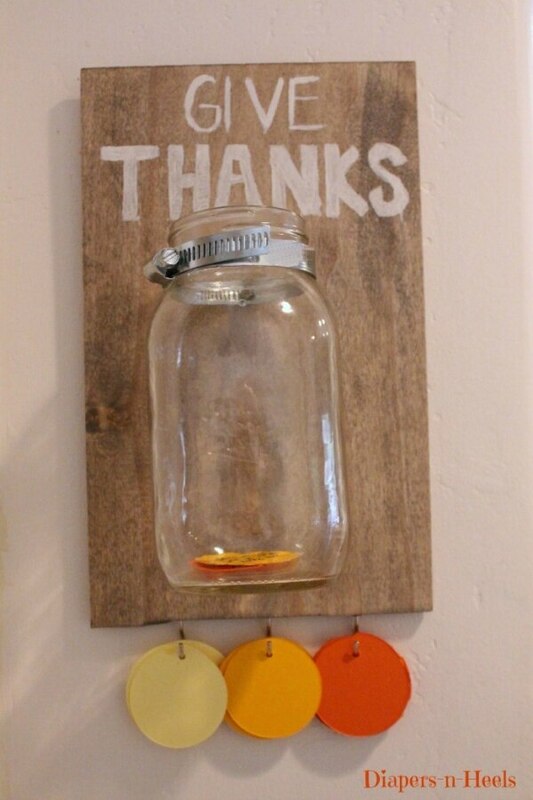 Re-purpose an extra-large jar to become a thank you “bank.” Keep it in a central place in the house and include colorful tags so family members can right down and “deposit” their thankful thoughts whenever they strike. If you’re short on time or crafting skills, the Internet is full of wonderful pre-made resources to help your family focus on what matters most this holiday season. Print out these bright and modern thankful cards and place them on your Thanksgiving table. Encourage guests to fill them out while waiting for the turkey to finish cooking. 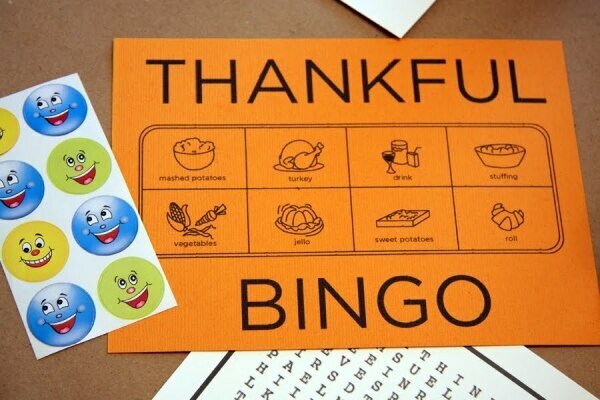 Everyone loves bingo, and this festive take on the simple game will get everyone’s hearts and minds into a thankful place. This is a great activity to help smaller kids understand and articulate what they are thankful for. 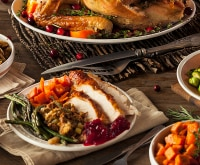 Place a simple little reminder — for both kids and adults — of what the feast is all about right on the table. 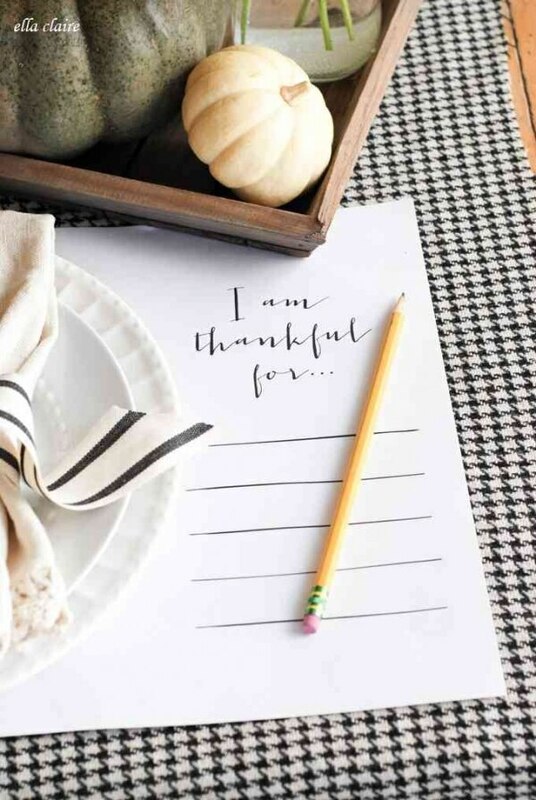 Use this free printable, or create your own including lines for people to write in what they are thankful for. 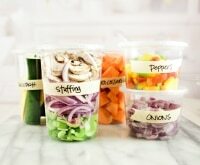 All month long, keep a glass jar handy and stock it with bright strips of cardstock and a marker. As family members fill out strips of the things and people they’re grateful for, tape or staple the strips into a paper chain. 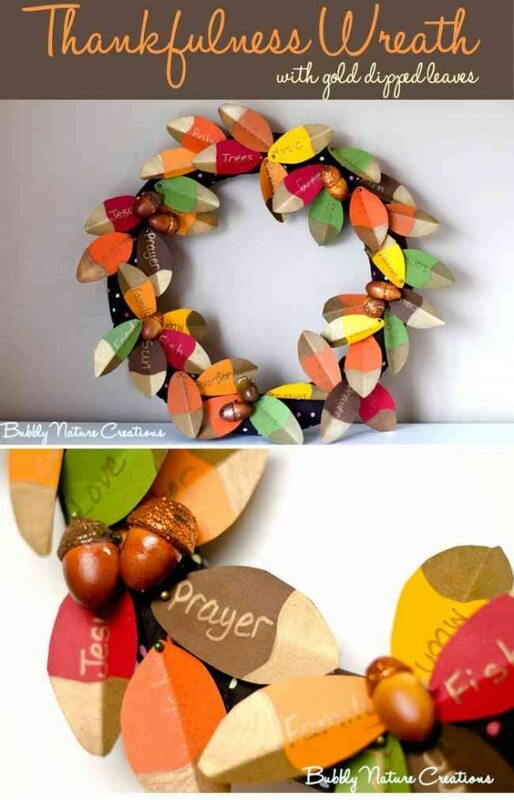 On Thanksgiving Day, use the paper chain to decorate your buffet table or mantel for guests to see and enjoy! This simple printable place mat is not only a great activity to help kids focus on the reason for the meal, but is also a great way to keep them busy while guests arrive and the meal is being prepared. Put out crayons and markers and encourage kids to fill out their place mats however they wish! 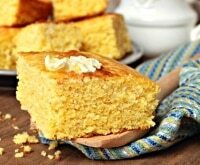 For older guests, offer a more mature and write-in-friendly paper place mat. 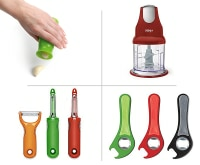 Have pencils handy and ask guests to fill them out during the meal, then share over dessert. 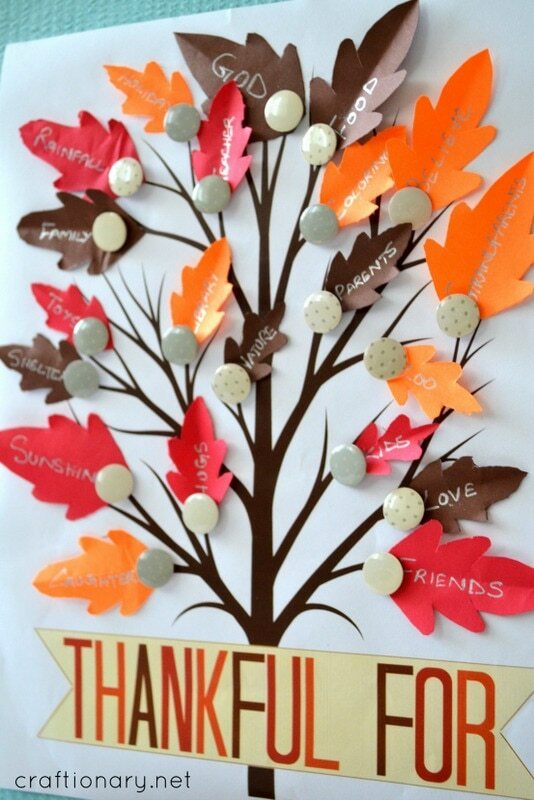 If you don’t have the space to feature a larger thankful tree, consider making a smaller, one-dimensional one that fits into a frame. This free printable will make assembling this fresh and colorful display easy for any level of crafter! As a family, write down all the things you’re thankful for on pretty, gold-dipped leaves with metallic pens. Combine them with acorns to create a bright and festive way to greet guests at the door! Although hearts are often associated with Valentine’s Day, this family craft and activity is a phenomenal way to teach children how to notice and appreciate kindness. Encourage kids to give small hearts away to those who do kind things as a way to say “thank you.” The accompanying worksheet allows kids to reflect and be grateful for the abundant kindness in their lives! While it’s fun and festive to make paper turkeys and pilgrim hats this season, try to include a craft or two that reminds kids and the family of the “reason for the season.” From thankful trees to thankful banks, surely you can find a clever craft that will work for your family!